Recently, I had the honor and privilege of being part of a Group Writing Project. Our subject: Psalm 23, a most beloved part of Scripture to countless Christians. Courtney, at Faithful Bloggers, whose idea this was in the first place (thank you so much, Courtney!) has put all the 26 contributors' writing into an e-book! I've been reading through all the entries, and I know that you will be blessed, as I've been, by what the Lord has laid on each woman's heart. I appreciate Courtney's vision and initiative to put this project together, and now she has made it into an e-book and generously allowed us to share "All About Psalm 23--A Christian Group Writing Project" with all of you--free of charge!! I'm very excited to be able to offer you the opportunity to download this free e-book of devotions on a most precious chapter of the Word of God, Psalm 23 (see below to download). I know you're going to grow in your relationship with the Lord through reading and pondering the thoughts shared on this familiar passage. 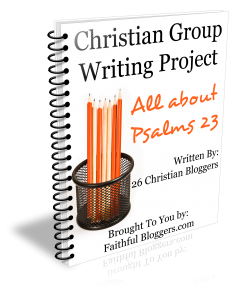 Download your Psalm 23 Christian Group Writing Project free e-book here!